Enjoy the quietness of the lounge at the luxury accommodations of the Tuckamore Lodge in Main Brook, Newfoundland in Canada. The lounge at the Tuckamore Lodge is a great place to sit and enjoy an evening cocktail looking out into the vast wilderness that surrounds the lodge in Main Brook, Newfoundland in Canada. The furniture and stunning wooden walls and floors in the lounge blend in with the country style design of the Tuckamore Lodge. 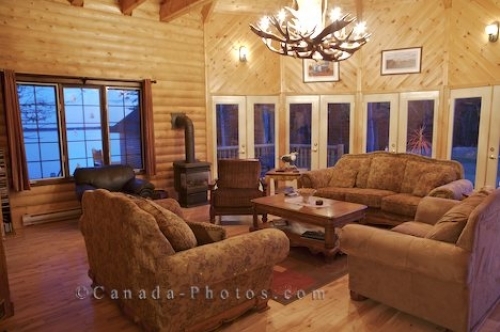 Picture of the elegant lounge area at the Tuckamore Lodge just outside of Main Brook, Newfoundland in Canada.